Figure 23-1. Quantitative Southern blot analysis for partial or complete deletions in the VHL gene. 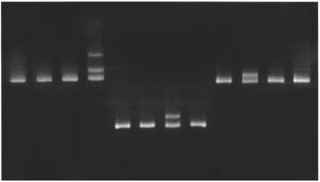 Genomic DNA (5 |g) is digested with Eco RI and Ase I. Digestion products are separated by agarose gel electrophoresis and transferred to a nitrocellulose membrane by capillary blotting. The filter is hybridized to random primer-labeled probes specific for the VHL gene (g7) and the beta globin gene (as an internal standard for DNA loading). Normal controls (lanes 1,2,4, and 7) exhibit a single intense VHL gene band. Patients with a partial deletion in the VHL gene exhibit a less-intense VHL band and a band of altered mobility (lane 6). Patients with a complete deletion of the VHL gene exhibit a band of decreased intensity (lanes 3 and 5) compared to controls when equal amounts of DNA are loaded on the gel. (Reprinted with permission from Chernoff A, Kaspar-cova V, Linehan WM, Stolle CA. Molecular analysis of the von Hippel-Lindau disease gene. In: Methods in Molecular Medicine Serles,vol 53: Renal Cancer: Methods and Protocols. Mydlo JH,ed.Humana Press Inc., Totowa, NJ; 2001, p. 193-216. PCR amplification and DNA sequence analysis of exons 1 to 3 of the VHL gene (including the adjacent splice donor and acceptor sequences) will detect all disease-causing point mutations. DNA sequence analysis is typically performed on an automated DNA sequencer using fluores-cently labeled dideoxy terminator nucleotides. 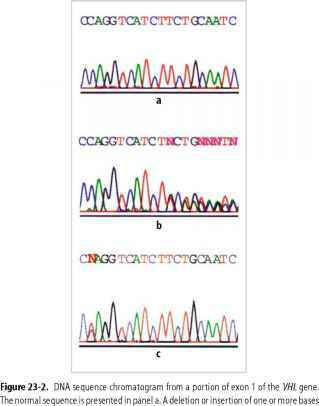 Both single base changes and small insertions or deletions may be detected as the appearance of two bases in any given posi-tion(s) of the DNA sequencing chromatogram (see Figure 23-2, panels b and c). A mutation-scanning method such as conformational sensitive gel electrophoresis (CSGE) may be used to identify mutation-containing exons prior to DNA sequence analysis. CSGE involves denaturing and reannealing PCR products to form heteroduplexes and homoduplexes that then are separated on a polyacrylamide gel. Exons exhibiting shifts (see Figure 23-3, lanes 4,7, and 10) are sequenced to identify the specific mutation.